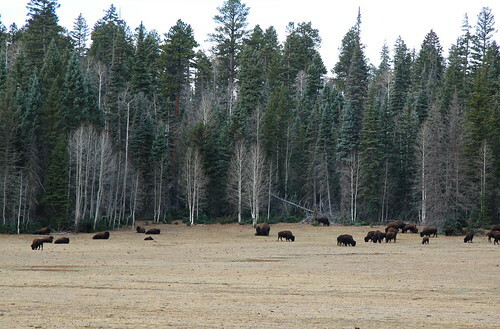 Native to Arizona, Colorado, Idaho, New Mexico, Utah, and Wyoming. Widely cultivated as an ornamental. Naturalized. 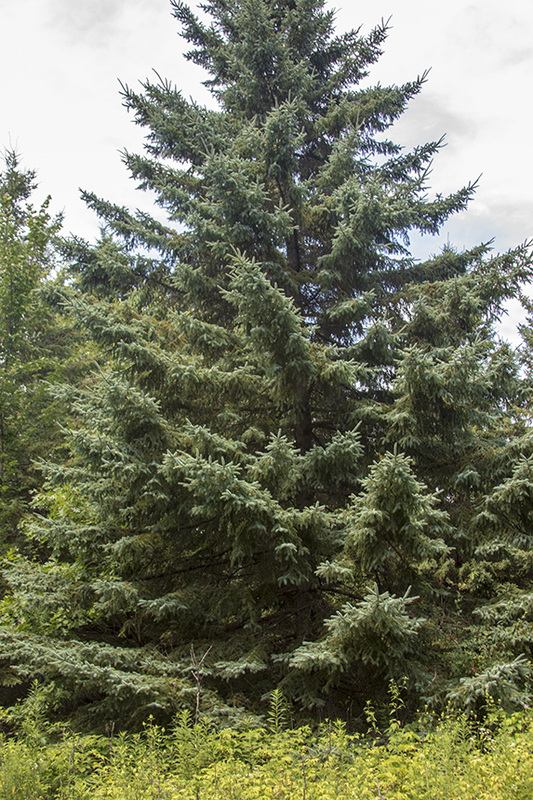 This is a slow-growing, evergreen, coniferous tree rising on a single trunk from a relatively shallow, horizontal root system. It is long lived, surviving 150 to 200 years. 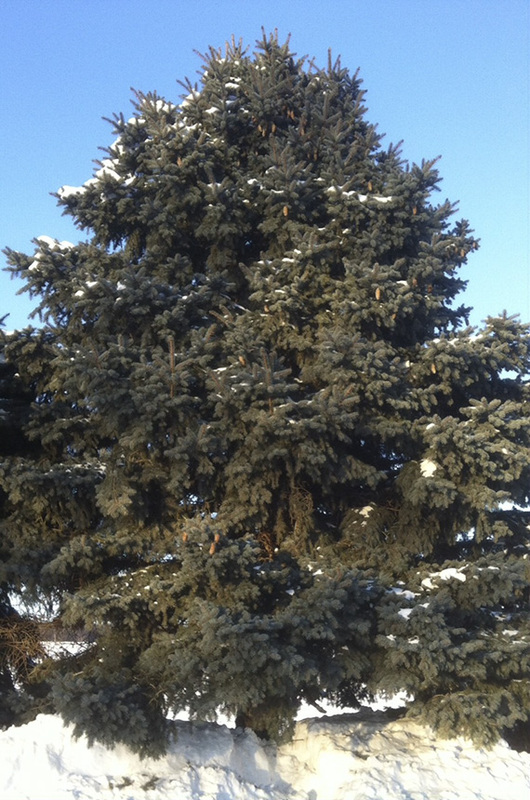 In Minnesota mature trees are usually 30′ to 60′ tall and up to 36″ in diameter at breast height. Older individuals in its native range may be up to 600 years old and over 120′ tall. 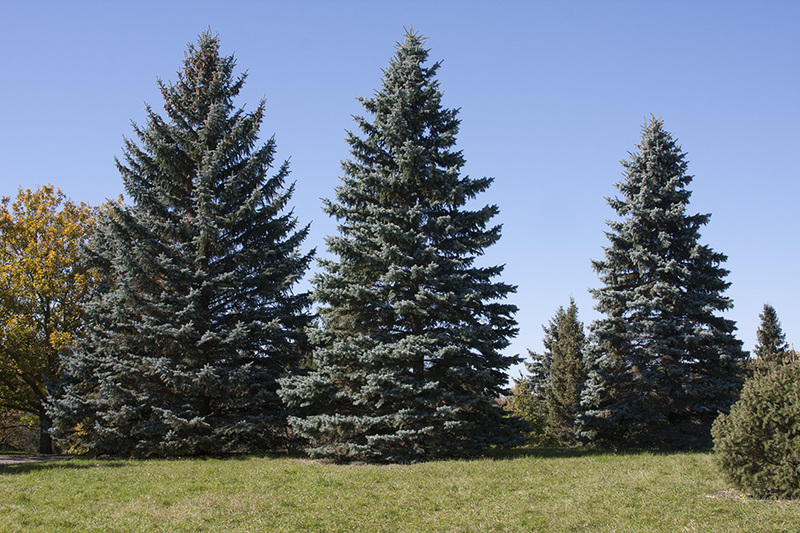 Young and mature trees have a pyramidal crown that is persistent to the base. The trunk is straight and distinct to the top of the tree. The bark on young trees is grayish-brown and flaky. On mature trees the bark on the lower part of the tree is thick, reddish-brown, and furrowed with scaly, round ridges. The branches are horizontal and whorled, each whorl representing one year of growth. The tree’s age can be determined by counting the number of whorls from the bottom up. Upper and middle branches are ascending or horizontal. Lower branches are slightly to strongly drooping. The lowest branches often touch the ground. The twigs are stout, yellowish-brown, and usually hairless. They do not hang downward (droop). The buds are ¼″ to ½″ long and rounded to bluntly pointed at the tip. They are covered with overlapping, papery, yellowish-brown scales. The scales are usually bent backward. 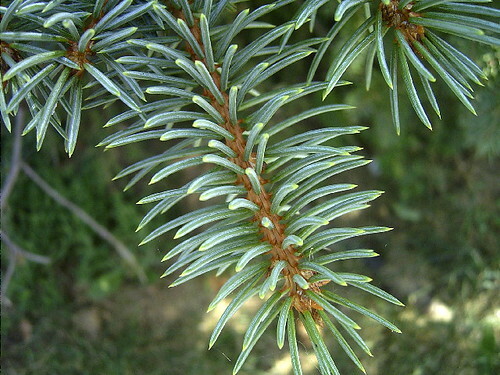 The needle-like leaves are widely spreading, somewhat swept toward the tip of the twig, and somewhat curved forward. They may be green, bluish-green, or silvery-blue. 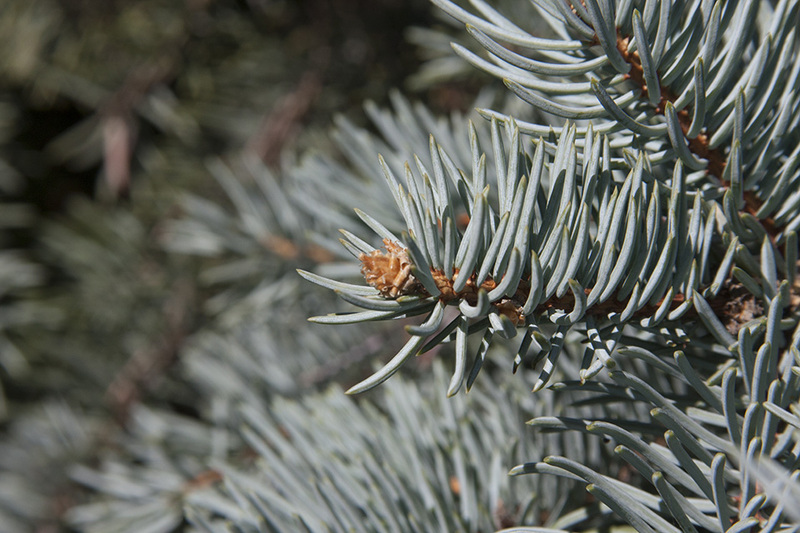 They are evergreen and can remain on the tree for up to 10 years. When crushed they emit a pungent resinous odor. When young they are covered with a whitish, waxy coating (glaucous). Each needle is ⅝″ to 13 ⁄16″ long and 1 ⁄16″ wide. It is borne singly on a peg-like base that persists after the needle is shed. It is stiff, sharply pointed, 4-angled, and square in cross section. There are two whitish lines of minute openings (stomata) on each surface. Each whitish dot (stomate) is a pore surrounded by two glaucous guard cells. The guard cells control the size of the opening, allowing the exchange of gasses and water vapor. 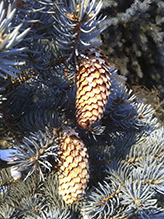 Male and female cones are borne on the same tree. Pollen (male) cones are rose red when they first emerge. 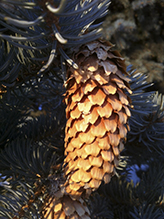 Mature cones are fleshy, yellow to purple, oblong, and ⅜″ to ¾″ long. They are borne in whorls of 3 to 5 at the base of new shoots or singly near but not at the tip of the shoot. They appear throughout the crown but are more numerous in the upper half of the crown. 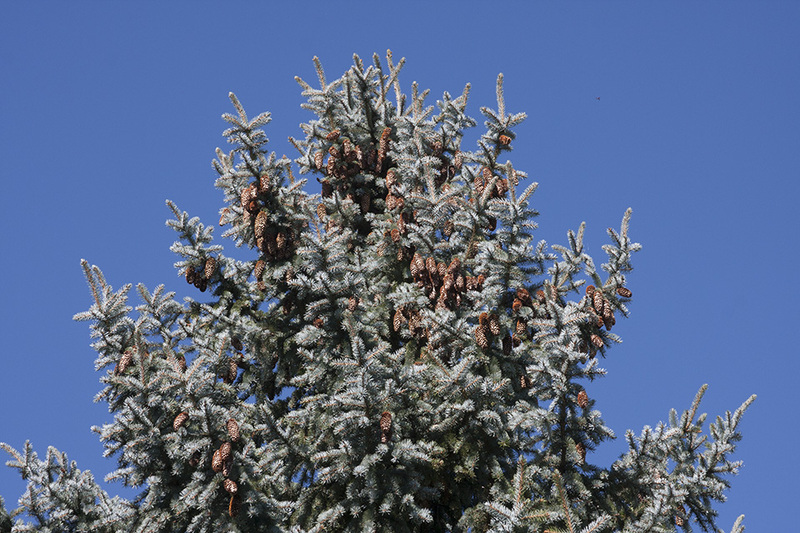 Female cones are covered with pale green scales when they first appear. They are borne usually in clusters of 2 or 3 at the tips of the new shoots. As the cone becomes receptive the scales become red and the cone becomes erect. The scales toward the base of the cone are bent backward 90° or more. At the time of pollination the cones are ⅜″ to ¾″ long. They are appear in the upper 10% to 25% crown. 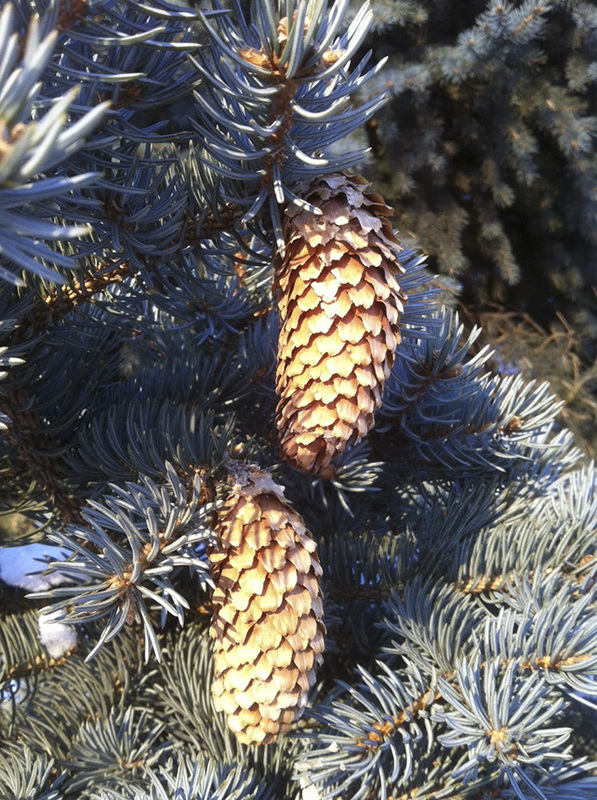 Four weeks after pollination the cones hang downward and reach their full size. 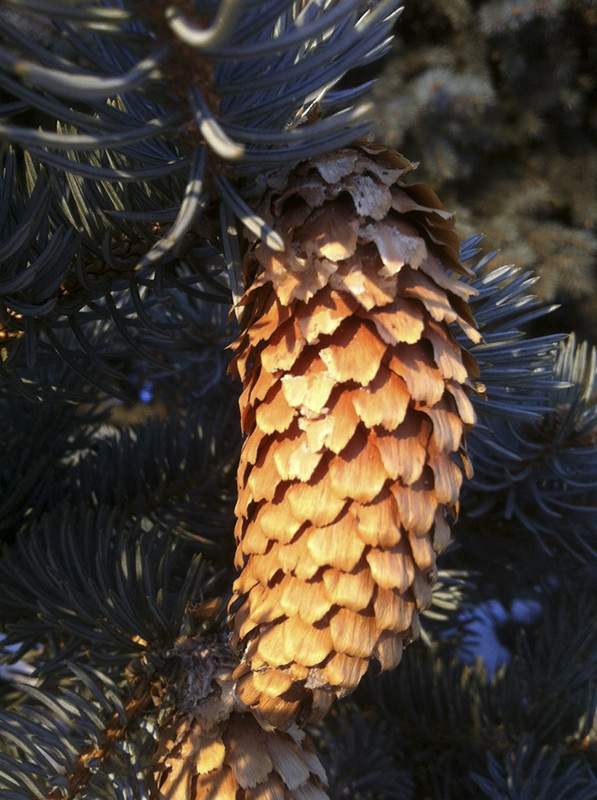 Mature cones are 2⅜″ to 4⅓″ long. The scales are diamond-shaped, straw-colored, and papery. Pollination takes place May or June. Male cones shed pollen then wither and fall away. 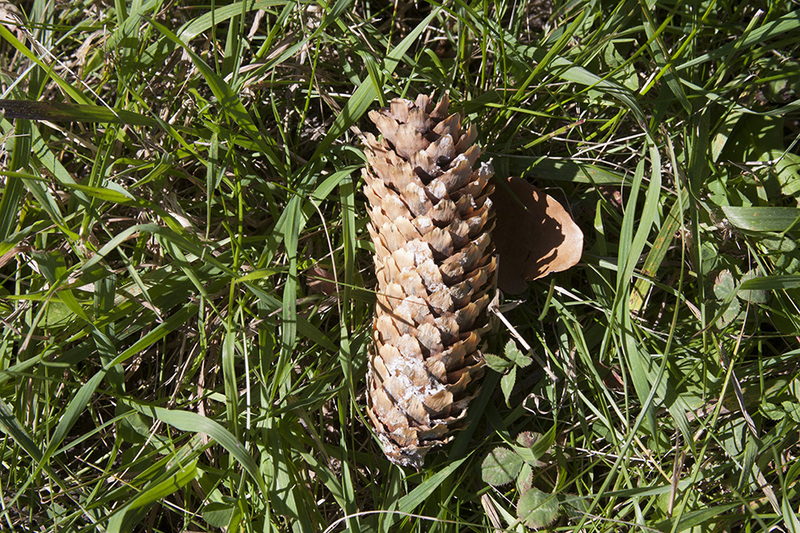 Female cones mature in August of the first year and disperse seeds in September. No records are kept for non-native species. This is the state tree of Colorado and Utah. 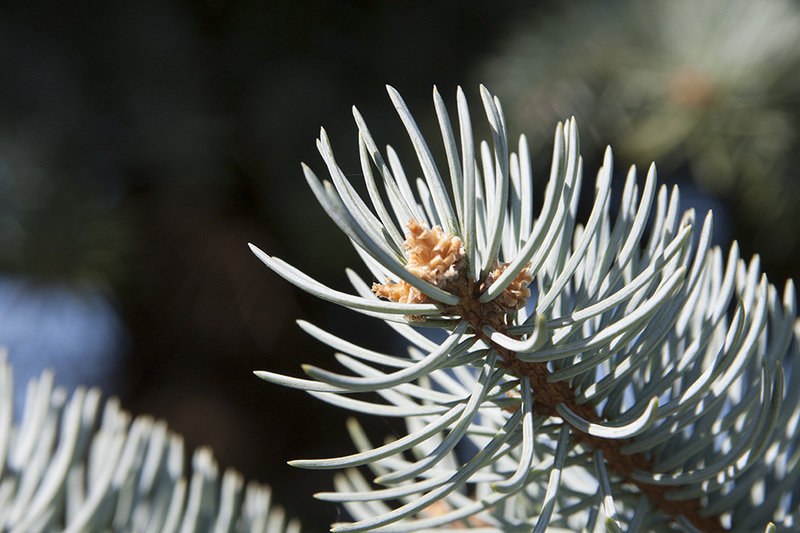 he Mono Lake Salty Bath Company Presents a wild love of picea pungens, the blue spruce. 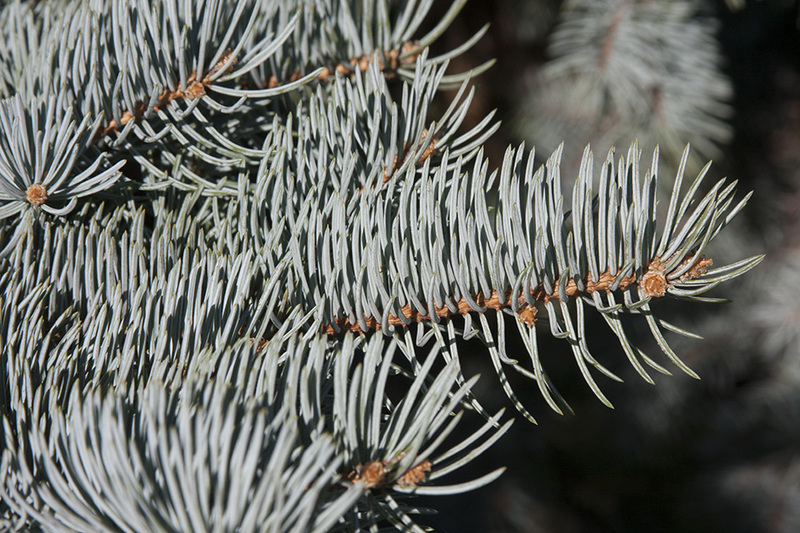 Evergreen needles, 3/4 to 1 1/4", stiff and very ... all » sharp like bayonets, displayed nearly straight out from twig, silvery blue to dark green. Strong acidic taste but makes a fine tea.